I love mangoes. So much so that I eat them in every possible form: the normal fruit, the dried fruit, the pickle, the juice, ice cream, sorbet, whatever. Even in joke form. Mangoes in to a bar. 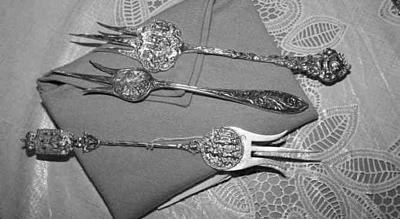 If you want to know more about mango forks, you need to read Maura Graber’s forthcoming book, Let Them Eat Cake. Don’t you just love it when people design useful things? 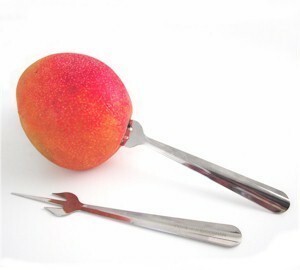 two utensils eminently suited to me … mangoes and moustache! JP, Now you have done it! My wife is also a mango lover. Please let me know where I can get her the mango fork. You can get mango forks from me, as my collection has taken over my place. Email me, and I can send photos & prices. P.S. 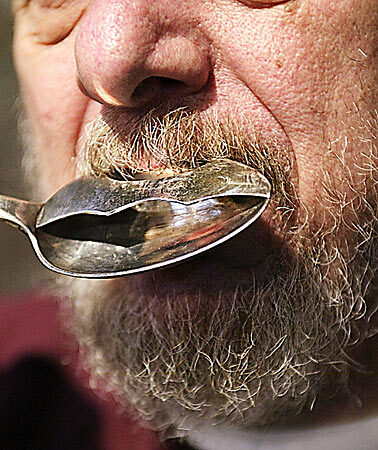 You can also get mustache spoons from me! Maura, thanks for dropping by. I’ve emailed you as asked. Now I can begin to consider ordering soup when bearded…. Only slightly off topic, but a genuine question. Where do you buy mangoes in the ten months of the year that our traditional “Indian” mangoes are not available? Do you eat the tasteless blobs that are stocked by standard supermarkets? Rana, I have the advantage of living in Windsor, a stone’s throw away from Slough, where I can get fresh mangoes from India maybe four months of the year. The local non-chain “supermarket”appears to sell mangoes for most of the year, they tend to look small and wizened and drab in comparison to those in the big supermarkets, but they win hands down on taste.